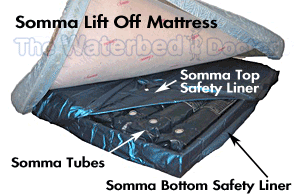 The Waterbed Doctor Makes It Easy to Order Replacement Parts for All Softside Waterbeds. This water chamber is considered extra firm. 1. Choose Brand Name 2. Choose Free Flow or Waveless 3. Choose Size of Bed. ORDER 5 OR MORE AND RECEIVE $5.00 DISCOUNT PER TUBE!! 2" Thick Standard Non Pillowtop Replacement Quilted Zipper Plush Cover for 6", 7", 8" or 9" Profile Height. 1. Choose Brand Name 2. Choose Foam Profile Height 3. Choose Size of Bed. 2. Choose Foam Profile Height ----> 6" 7" 8" 9"
2 1/2" Pillowtop Replacement Quilted Zipper Cover for 6", 7", 8" or 9" Profile Height. 4" Thick Euro Pillowtop Replacement Zipper Cover with Memory Foam or Latex for 6", 7", 8" or 9" Profile Height (Height of Foam). 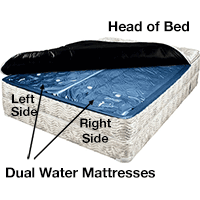 For Single Bladder or Tube Style Soft Side Waterbeds - A Full 5 Year Unconditional Warranty. Best In The Industry! 5 year Limited Warranty. First 2 years Free Replacement. Pro-rated years 3 through 5. 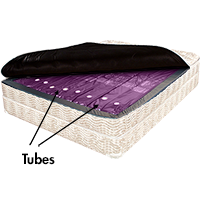 The Perfect Prescription for Tube Style Waterbeds. Simply Add a Tablet to Each Tube every 12 Months. All Purpose Waterbed Conditioner 8 oz. 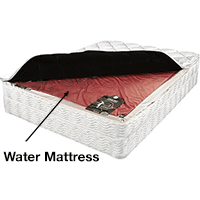 Electric pump for filling and draining a waterbed mattress.